Whenever you need to use stock resources for your purposes, it is required to know about copyright restriction associated with those stock assets to avoid legal hassle. The listed resources that are given here are free of copyrights. It means these stock resources are under Public Domain. “Creative Commons CC0” license give you the flexibility to use, copy, modify, distribute and perform the work for personal and commercial purposes without asking permission. Some of these resources don’t even need to give attribution but we recommend you to do so to support creators work. 1. Pexels: In Pexels you will find variety of free stock photos for free and can use those for personal and commercial purposes. They say they add 100 high-quality photos to the site every day. Copyright and Attribution: licensed under CCO, so it’s copyright free and no need of attribution. 2. Pixabay: A man named Hans Braxmeier is the founder of Pixabay. You will be very happy to discover over 1.1 million photos and videos in this website. Copyright and Attribution: Copyright restriction and attribution free. 3. ISO Republic: This is an amazing place for high standard ISO photos and if you are a creative professional, this site will provide you a lot of free stock photos. It’s providing its service since 2014. 4. Foodiesfeed: You must visit to Fooiesfeedto enrich your design with food photos. Food lovers would love this reouece! Copyright and Attribution: Copyright restriction is free but attribution has to given to the photographers. 5. Barn Image: If you are looking for portrait photos, this is the ideal place for you to get those. This website is ideal for abstract, landscape, architecture and cityscape photos. Copyright and Attribution: Copyright restriction free and no attribution. 6. Unsplash: You can find high quality photos from this source. They upload new photos every 10 days. Copyright and Attribution: Copyright restriction free and no attribution is required. 7. Negative Space: High resolution photos are available here. There are lots of portrait photos. 8. Burst: This is a resource created by Shopify. 9. Picography: Picography is an awesome place to find stock photos. Photos are submitted by Dave Meier. 10. MMT Stock: It is created by Jeffrey Betts to provide you with premium quality photos . 11. Jeshoots: The site contains animals, background, city, food, mockups, nature, people and technology photos. Nature and city photos are marvelous. 12. Morguefile: For nature and structure portrait this is the best source. They have selection of 350,000 photos for you. 13. Death to Stock: This source mainly contain photos about human body. 14. Pikwizard: Free stock photos for all your creative needs. Copyright and Attribution: No copyrights but some images are not allowed to use for commercial use. Also some stock assets require attribution. 15. Magdeleine: You will get new photos everyday in here with good photo resolution. You can find more free stock photo sources from THIS ARTICLE. Icon is a symbol or graphical representation of something. Icon enriches designing concepts. Icon is used for logo designing or symbolize something with a greater meaning but in a short form. So they carry a lot of importance to designers. 14. Flaticon: Flaticon is basically a website of thousands of icons. This is one of the largest icon databases containing PNG, SVG, EPS, PSD and 64 base formats. 15. Iconsdb: Iconsdb will take extra care of you by providing different types of one color icon. Creative professionals can get all its 4130 icons in any color they want. 16. Icon Finder: You can find free and premium collection of Icons from this resource. Copyright and Attribution: There are Copyright restrictions for some icon sets. 17 Noun Project: It is a 100,000 premium icon resource. The following vector resources will help the creative professionals a lot. 18. Vector Graphics: You can find background vector image, wedding vector, vintage and many more in one place. You have choice to download a vector in EPS file or a layered Photoshop file. 19. Vectorportal: You can find every types of vectors from this site. Copyright and Attribution: Copyright restriction free but attribution has to given to the artists. 20. Vecteezy: You can go crazy with Vecteezy. This is the largest vector graphics community in the world. You can easily find every vectors you need for your next project. Most of the vectors are free in this place. Videos have the ability to attract, engage and bring more audience to a website. Here are some web resources that would be useful for getting good videos to your site. 21. Coverr: Thousands of videos are available here with different categories. Coverr usually adds 7 videos in every Monday. Copyright and Attribution: Copyright restriction free and no attribution has to be given to the artists. It’s totally free for your personal or commercial use. 22. Motion Backgrounds: If you go to this site, you will find it as the headquarter of professional quality motion backgrounds and motion videos. You will find from mathematical motion videos to water, abstract, booming, texture, nature and what not. They provide quality videos on various topics. Copyright and Attribution: Copyright restriction free and no attribution has to be given to the artists. It’s also totally free for your personal or commercial use. 23. Videezy: Many talented videographers are contributing in this website. Videezy and Vecteezy are from the same network. Videezy covers 2 million visitors a month. There is a opportunity to share your contents with the other Videezy users. Copyright and Attribution: Copyright restriction free and no attribution has to be given to the artists. It’s also totally free for your personal or commercial use with some exceptions. 24. Audio Library: This is an official resource provided by YouTube. YouTubers can safely use these resources in their creative work. These are copyright free so you can use them to your work too. Copyright: Free from copyright restrictions. 25. Free Music Wave: This YouTube channel is useful too for audio/sound resources. If you are an animation lover and want to use audio visual both, you should visit this channel at least once. 26. Free Stock Music: This site is a free audio repository. You can find audio collections easily. 27. RoyalTrax: This is a YouTube channel that provide free audio music. They mainly provide soft, classical and rock music. 28. HeroBoard: If you want Hero Thriller audio music, this is the best source. 29. Ninety9Lives: This site provide updates in regular basis. 30. NoCopyRightSounds: This site will connect you with pop music wave. If you are pop music lover and want to use pop music to your web page, this could be your ideal music channel. Here you will found fearless, live stream, invincible flavored music and many more. 31. Incompetech: This is a fully audio database. You can find A-Z audio music as per need. This music database was started in 1997 and has created big reputation. Copyright: Free from copyright restriction. 32. ProFx: No signal deed sound, footstep sound, sword sound etc can be found in this YouTube channel. Basically it will provide you macro audio sound or rewind sound effect. So, if you want to try this in your web page, this is the best source. 33. Freebiesbug: This is a Hand-picked resource center for web designers and DIYers. It mainly provides website template on which you can build your web site. You can also get wordPress themes and some stylish fonts. 34. Freepik: Here you can download vector images from PSD and EPS format, high resolution stock images and icons and many more.. all at one place. This website is very resourceful for the web designers. Copyright and Attribution: Freepik’s own resources are free. Third party resources have restrictions. 35. GraphicBurger: GraphicBurger is a full of premium quality design resources. If you are addicted with Photoshop, these resources are surely for you. The people who like pexel must like these creative resources. Copyright and Attribution: Free from restrictions and attribution. 36. Premiumpixels: Premiumpixels provide you with free premium quality design resources. Premium Pixels is created by UK based designer Orman Clark. You will find lot of freebies like flat and micro icons and WordPress themes. 37. Webdesigner Depot: This resources is full of articles, free icons, vectors and dashing fonts that all will make your web page unique. Copyright and Attribution: Free from copyright restrictions and attribution. 38. Font Squirrel: This source has thousands of free fonts that can be used in your designs. 39. Dafonts: Dafonts is another good source for many kind of stylish and modern fonts. 40. Typecast: Typecast provide more than 4,000 fonts that can be used in your web designs. So there you have it. 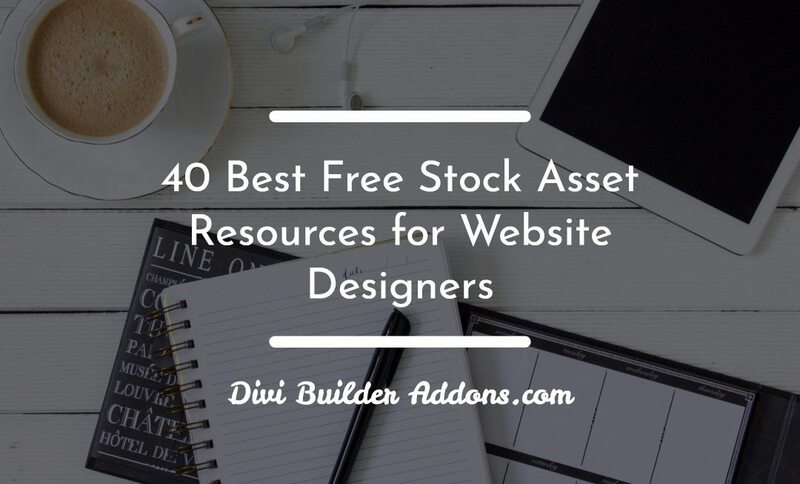 Those are the 40 best online stock asset resources we found. If we have missed anything feel free to mention those in the comments section. Have fun doing your creative work!